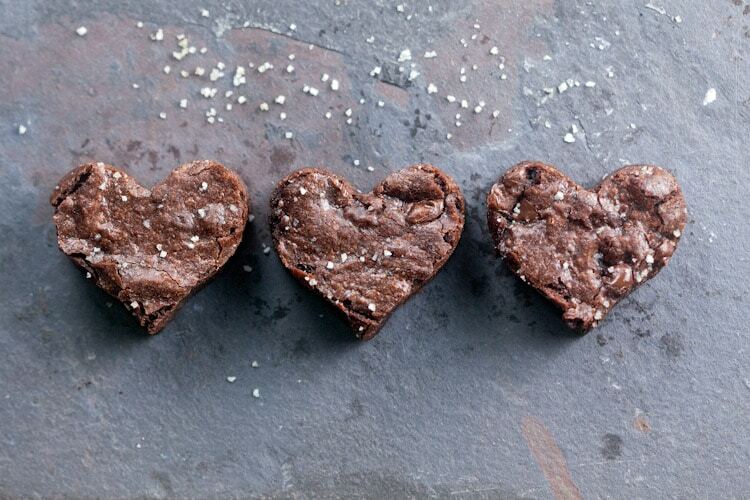 Chocolate Brownies with Vanilla Salt | Healthy. Delicious. Finally – homemade brownies that are just as rich and fudgy as ones from a mix! 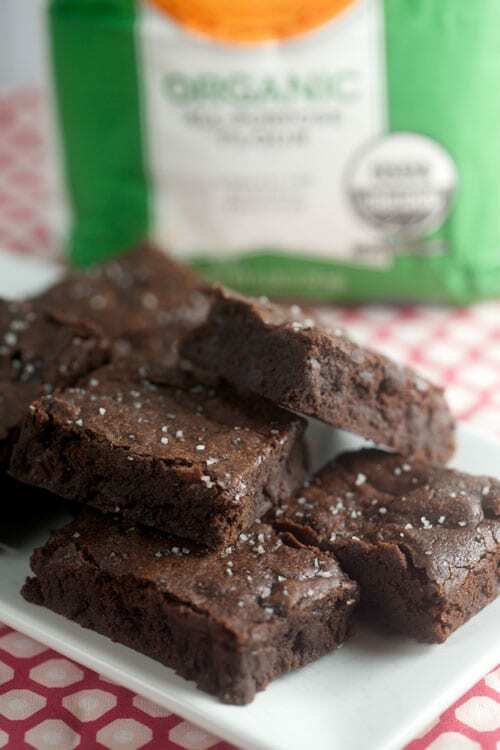 Topped with a smattering of sea salt, these brownies will put a smile on people with a sweet tooth as well as those whose usually prefer salty snacks. I was planning to save these brownies until next week since they’re kind of Valentine-y, but I couldn’t wait one more second to share them with you. Seriously, these brownies are ridiculously good. Without question, they’re the best brownies I’ve ever eaten. I’ve been on a pretty serious brownie kick this winter, but until I came up with this recipe I relied on box mix. I know, I know… but I also know I’m not alone on this one. Pretty much everyone I know says they prefer box mix, and I get it. Homemade brownies just never seem to stack up: they’re too cakey and they don’t get that delicious crispy-crackly layer of goodness on top. Until now. 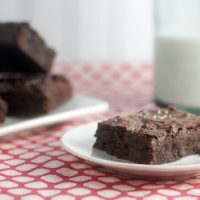 I studied the ingredient list on my favorite box mix brownies and did a ton of research. These were the result, and they’re incredible. Better than the box, if I say so myself! I started by making my own cake flour by mixing Gold Medal all purpose flour with cornstarch. My cabinets are so stuffed that there just isn’t enough room in there for another kind of flour, but doing this helps keep the brownies incredibly tender and delicate. 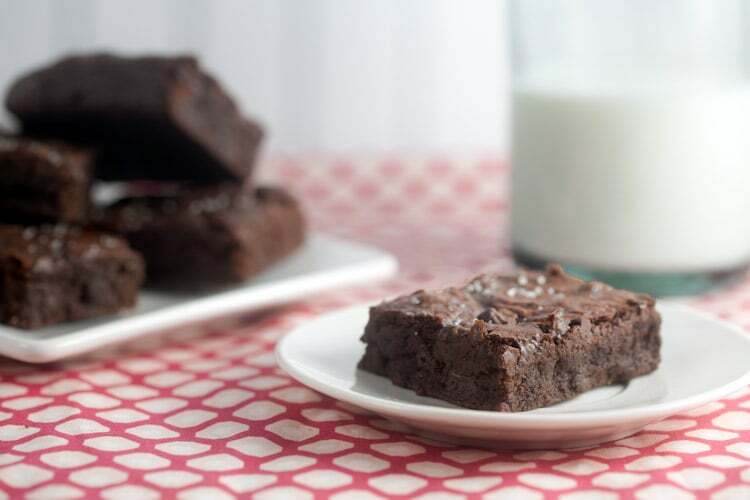 Corn syrup might seem like a strange addition, but it’s the secret to making these brownies insanely fudgy (if there was such a thing as a brownie that’s too fudgy, these might be cutting it close). I also added some instant coffee, which is something I love to do with most chocolate desserts. It adds a touch of bitterness that makes the chocolate seem even richer. Then, as though all of that wasn’t enough, I topped them with a smattering of vanilla salt. Total over-the-top goodness! Heat oven to 350ºF. Line the bottom of an 8x8 pan with lightly greased parchment paper. In a mixing bowl, stir together the flour and corn starch. Mix in the sugar, cocoa powder, salt, and coffee (if using). Stir in the oil, water, corn syrup, eggs, and vanilla extract. Mix until combined into a very thick, glossy batter. Stir in the chocolate chips. Spread batter into the prepared pan; sprinkle with vanilla salt. Bake 35-40 minutes, or until a toothpick inserted into the center comes out clean. Let cool; cut into 16 brownies. To make vanilla salt, combine 2 tablespoons of coarse sea salt with 1 scraped vanilla bean. Store in an airtight container along with the bean pod. This post was sponsored by Gold Medal Flour. Thank you for supporting the brands that keep me inspired in the kitchen! Love these! 🙂 Perfect crackle on top & love the use of vanilla salt for a fun twist. We stumbled more than here by a unique page and thought I could possibly check issues out. I like what I see so now i’m following you. Look forward to finding out about your internet web page to get a second time. 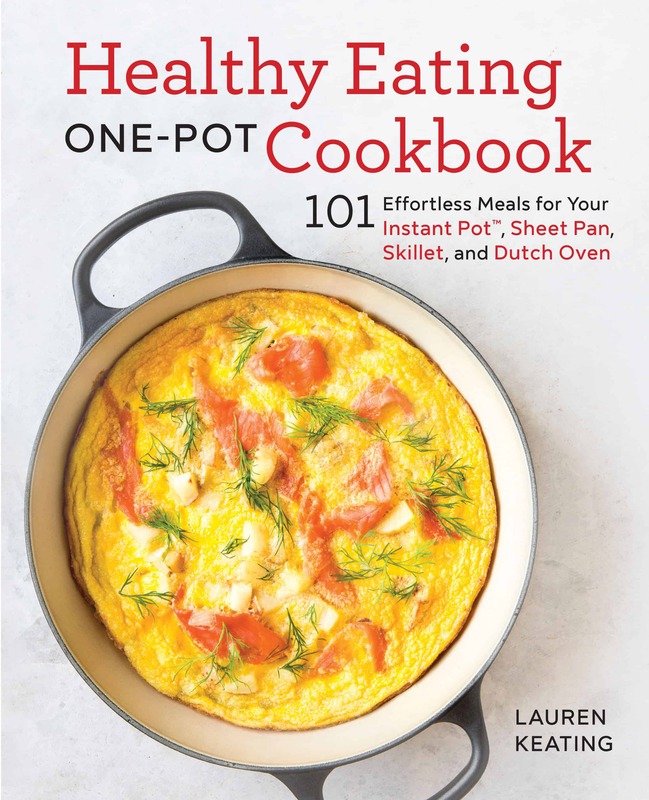 Wow, nice work putting vegetable oil AND corn syrup in one recipe. I know brownies aren’t supposed to be healthy but jeez, I’m at least trying to survive til my fifties. you can leave the corn syrup out, but they won’t be as fudgy. And if substitute maple syrup or honey? It will be ok? You might have achieved brownie perfection here! Two words: VANILLA SALT. These are perfect Lauren! Cake flour. Good plan! I’m probably the opposite…I HATE box mix. But I think that’s because I’ve had really good real brownies. And really bad boxed brownies. THese look awesome though. Love the hint of vanilla salt. MMmmmmmm these looks sooooo delish! 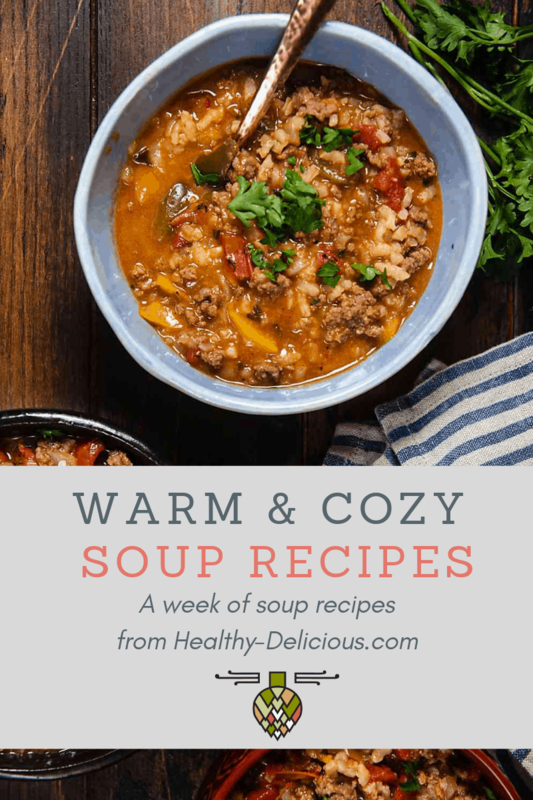 LOVING this recipe and that you reduced not too much of the fat to keep the texture! That little crackle on top is the best part of brownies! I love what a bit of salt does to desserts! I’m sure it says but did you use an 8 x 8 or 13 x 9 pan? These look delicious! Fudgy brownies are the best! I can imagine how vanilla salt take these over the top. Yum!